I knit up a couple of bits last night for M's book. This first book will be texture collages, a different color on each page. The orange is a piece of furry fabric. 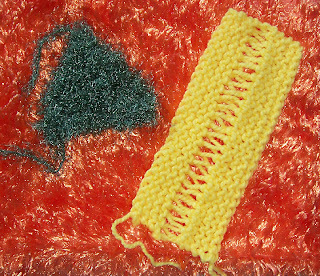 The knit bits are fun to do when I want something to work on without pulling out bins of supplies. I've been making progress on my sampler. 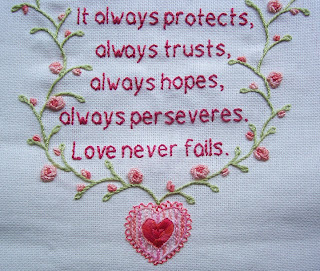 Here you can see the verse is finished, I've embroidered a heart at the bottom, and I've started on vines that will frame the piece. The bullion roses and buds still need leaves and stems. I think I'll add something to the center of the heart, but I'm not sure what, maybe a couple of bullion roses or a charm. The motif here started with the purple flower done with oyster stitches. Pink flowers were added with detached chains. Buds were sprinkled around the flowers with pairs of bullion stitches. Feather stitch greenery connected the buds. Lastly, detached chains were added for leaves. To balance out the darker motif, accent colors were added to the cream lace flower with simple straight stitches and a few split stitches on the longer green lines.